A brigadier-level flag meeting was held at Chakan Da Bagh in Poonch sector on the LoC on Monday. Pakistan strongly protested with Indian military authorities about continuous ceasefire violations including an attempted raid by Indian troops on LoC during last week in which two Pakistani soldiers, Havaldar Ghulam Mohyuddin and Naik Muhammad Aslam embraced martyrdom while one soldier was injured,” an army statement said. “During the flag meeting, Pakistan strongly rejected the Indian allegations that Pakistani troops resorted to unprovoked fire, attacked Indian post or killed Indian soldiers,” it added. Pakistan demanded a United Nations-led probe into the fresh skirmishes. During meeting, the Indian delegation was led by Brigadier TS Sandhu, according to Indian media. The spokesman said India also lodged its protest with Pakistan. Requesting anonymity, a brigadier in Pakistan Army told Pakistan's daily "The Nation" that both the armies had agreed to release tension and honour ceasefire following assurances from Indian army that it would abandon the bunker construction plan at the forward posts in Chondra village at the LoC, during the flag meeting. “It appeared that the matter was heading towards solution but this may not be the case,” he said commenting on the Indian army chief’s statement. “This has taken us by surprise. Everything was discussed and sorted out in the flag meeting,” the brigadier added referring to between the neighboring forces. 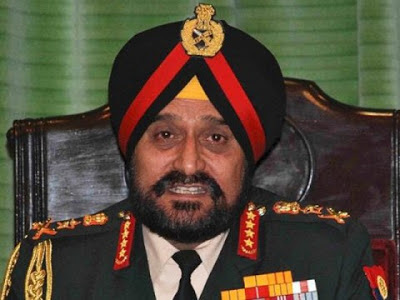 Singh said the ‘treatment’ meted out to the Indian soldiers last week was ‘an unpardonable act’ while adding that it should not lead to a breakdown in peace talks. “We want the Pakistani army to hand over the head of the soldier as soon as possible,” he said. “This incident has had strategic nuances, beheading our soldiers is not acceptable. The act was against ethics and principles of rules of engagement,” General Singh said. The Indian army chief also claimed that no operation at LoC was done by the Indian Army on January 6. “We want to keep the dialogue process on and also explore the best ways to communicate with Pakistan, but the attacks must stop,” Singh added. He said the Indian Army will fully back the actions of commanders at the Line of Control. Singh’s remarks which came hours before local commanders met at a crossing point on the ceasefire line for the first time since the fighting erupted to try and reduce tensions. Rejecting the allegations of unprovoked attack, Pakistan Army Monday said it strongly protested with the Indian authorities over the continuous ceasefire violations. Hours after Pakistan army commanders met their Indian counterparts, neighbouring country’s troops once again opened unprovoked firing at Battal Sector at LoC near Rawlakot injuring a man. Media reports said the Indian army opened unprovoked firing at Battal Sector but when the Pakistan Rangers returned fire, the Indian guns got silenced. The injured was admitted to hospital for medical treatment.